Billions of people are living longer, getting richer, and eating more energy intensive food – like meat. In the coming decades, the population of Earth will hit 9 billion. How can we feed 9 billion people from rapidly shrinking arable land? Food and water security are paramount for all, yet they are facing a potential crisis – and that presents an opportunity for astute investors. Now to make fertiliser, you need to mix nitrogen, phosphates and potash. And via their large potash and phosphate resource base, we have just identified an ASX listed company seeking to tackle global food shortages head-on. It owns one of the world’s largest glauconite (a source of potash) deposits in Western Australia. Within this glauconite is a large resource of phosphate nodules, from which the company is poised to generate $60M/year EBITDA over a +20-year mine life. It’s also holds a significant stake in German potash exploration licenses, with 4.5 BILLION tonnes of potential potash. That’s a lot of fertilizer. The sheer size of this company’s projects mean that much bigger JV partners could start to become very interested in the near term. However right now, this company remains very much under the radar, capped at less than $10M. 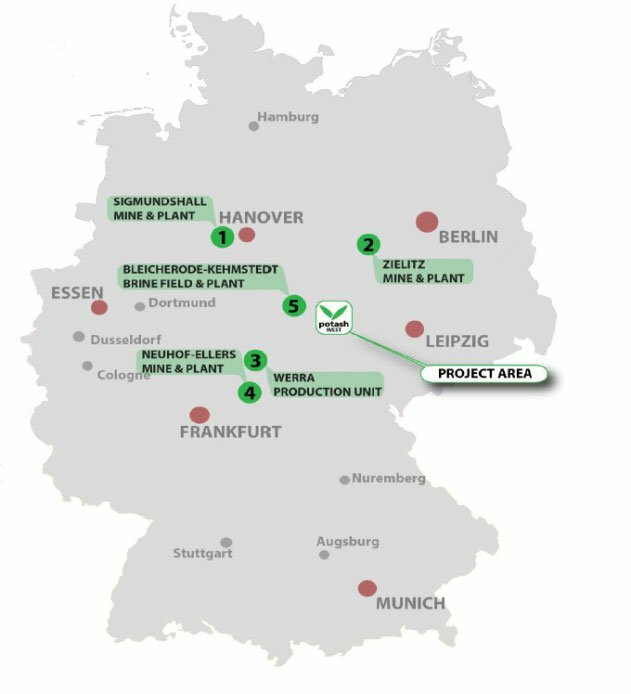 What really piqued our interest in this story initial was that the exploration project in Germany has many similarities with the early days of Highfield Resources – a company with an advanced potash project in Spain. The potential to reap serious rewards from potash is clear – can this ASX listed explorer follow a similar path to Highfield? 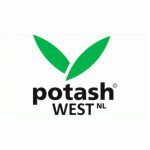 Potash West (ASX:PWN) is a sub-$10M capped minerals explorer with long-term ambitions to profit from potash. An Exploration program in Germany where PWN owns 55% of East Exploration Pty Ltd (EE). EE owns 450 sq. km of exploration licences in the renowned South Harz region. If successful with it’s next drilling programme, PWN will own a stake of an inferred resource totalling 200 million tonnes with an exploration target of 4-5 billion tonnes. This project has sanguine similarities to Highfield – but more on that later. PWN’s second project is located in the Dandaragan Trough in Western Australia and aimed at producing potash, phosphates and other minerals. The jewel in the crown is the Dinner Hill site from which PWN hopes to produce in excess of 250 million tonnes of phosphate ore. This IP has also enabled PWN to get involved in a new technology to extract lithium from micas, leading us to PWN’s final asset. Taking its patented K-Max technology a step further, PWN has a 25% stake in the IP relating to Lithium production. Lithium is a metal with demand growth predicted in excess of 10% per annum, driven by the dynamics of electric vehicles and lightweight batteries. PWN’s exposure to the Lithium market could potentially add significant revenue over the coming years given growing use of battery powered devices and vehicles. In essence, PWN is working on several routes to market via its own proprietary activities as well as forward thinking tie-ups with household names in the minerals and fertiliser industry. Even with all of the above, PWN still has a market cap of less than $10M... it may be only a matter of time to the market wakes up to this company’s potential. Do remember that we only use analyst reports as an isolated tool when we make an investment – it’s not the only thing we go on. What is Potash and What Does it Do? Potash is a generic name for various salts that contain potassium (K) in water soluble form. It is a key ingredient of fertiliser and is one of three non-substitutable major elements in fertilisers in addition to nitrogen and phosphorous. The potash market is like no other – only five companies control over 80% of global output. And seeing as these cartelists want to maintain a stable high price, they regulate the amount of potash being sent to market to avoid oversupply. It’s a high margin product, and from our investigations, we understand that these bigger producers are likely to limit the price to $400/tonne over the long term. 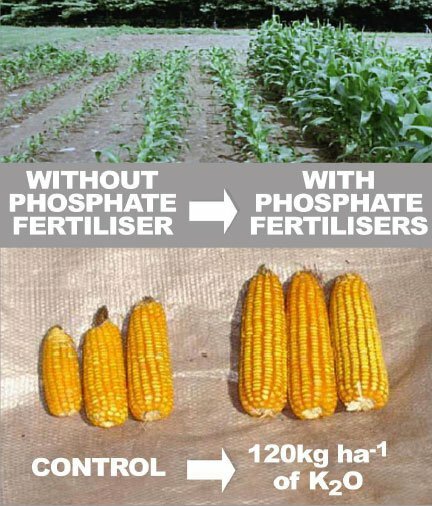 Potash allows farmers to achieve larger crop yields when correctly blended with other elements in fertilisers. Without fertilisers, crop yields are diminishing because of crop degradation reducing the quality of soil on a global scale. Also, the availability of arable farmland land is gradually falling worldwide in tandem with a rapidly growing global population – making food security a hot topic. With food and water security becoming a core issue, PWN is well situated to become a major contributor to the fertiliser market at a time of heightened demand. At this early stage of the company’s development, it could be a good time to look at PWN as a solid long-term investment focusing on food and water supply as major themes for decades ahead. Can PWN emulate Highfield’s success? One company PWN could potentially emulate in terms of development and market value is Highfield Resources (ASX:HFR). Highfield listed on the ASX in late 2011 and soon after going public, bought a brownfields potash asset in Northern Spain. Over this period, Highfield Resources was able to prove an Inferred resource, drilled and confirmed an Indicated resource and eventually announced results of a feasibility study which showed proven deposits in its tenements. PWN currently owns 55% of the South Harz project, and drilling will start on the Kullstedt exploration licence soon. Because there is substantial previous drilling on the licence it is likely that limited drilling to twin existing holes will allow a rapid definition of a JORC compliant inferred resource. When the exploration target has been evaluated at 4-5 billion tonnes, there is a strong potential value add for PWN on this imminent drill campaign. Can PWN via its significant holding in the South Harz project, repeat Highfield’s success? When looking at PWN and Highfield Resources side by side, a feeling of déjà vu inevitably surfaces due to the similar market and similar commercial strategies being employed by the two respective explorers. The global population is rising at an annual rate of 50-100 million people which means that by 2050, the planet Earth will have in excess of 9 billion people living on it – and almost certainly all of them will want to eat. In tandem, the amount of arable land available for farming is rapidly shrinking from 0.35 pp per hectare in the 1970’s to 0.15 pp per hectare in 2020 . More people means less space to farm and more has to be produced from a smaller amount of land. Fertilisers allow farmers to grow more crops from the same amount of land. The use of fertilisers has proliferated to such an extent that today, over a third of the world’s total food supply can be directly attributed to the use of fertilisers. Not only is the population expanding at an unsustainable rate, but the type of food people are eating is changing too. It is a societal tendency for people to spend a greater amount of money on meat and livestock as their standard of living rises – this makes sense. Most of the world’s population growth is coming from developing countries such as China, India, Africa and South America. As people in developing countries get richer, they would rather eat more wholesome food including meat rather than sticking to plain Jane grains and greens. This trend has a downside for farmers though. Producing meat is roughly 4-10 times more land intensive than producing grains such as wheat or barley. This means that as China and India become more developed and richer on average, their citizens are likely to spend an increasing amount of their incomes on meat and therefore put even more pressure on dwindling arable land. How quickly developing countries emulate their Western peers into falling in love with meat is unclear but when they do, it will be a bonanza for fertiliser sales in those regions. Every year the nutrient content of the soil used to grow our food (and clothing) is diminishing. To achieve the same quantity and quality of produce, farmers are having to use more and more fertiliser. The world will need a consistently higher production rate of fertilisers (with higher potency) over the next 30 years. The most populous countries in the world, China and India are currently seeing double-digit growth rates and a breath-taking surge in the amount of middle-class consumers. This trend is putting pressure on the global food supply and helping to raise food and commodity prices globally. 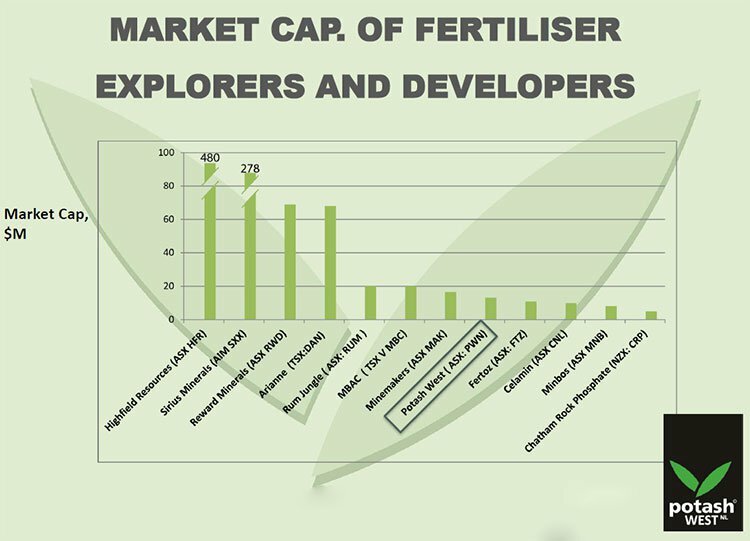 All in all, this is positive news for PWN’s ambitions to become a major contributor to the fertiliser market. As we mentioned earlier, PWN owns a stake in two active exploration licences in the South Harz region of Germany, with some interesting similarities to Highfield Resources. In partnership with world renowned German potash consultant Ercosplan, PWN intend to achieve a JORC compliant Inferred Resource of 200 million tonnes from an exploration target of 4-5 billion tonnes, within the coming months. 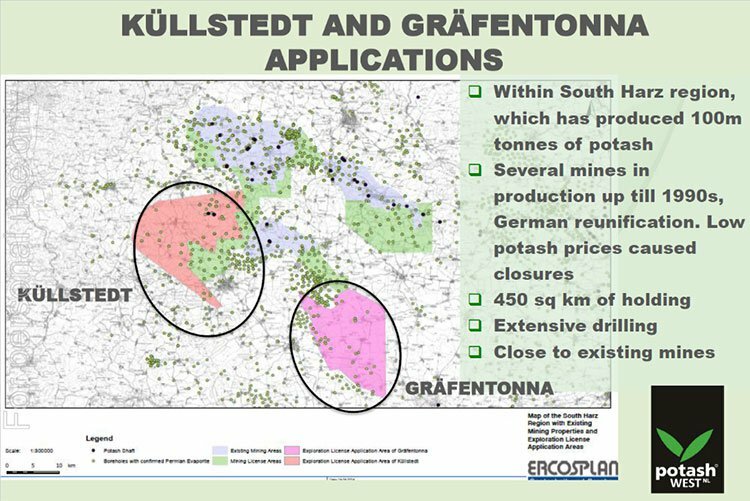 The central German region is renowned for its mineral deposits and given its 100-year history of mineral production, there has already been extensive drilling in the Kullstedt region already. This is a positive aspect for PWN because it helps the company to pick the best location for basing operations. The local consultants Ercosplan made an announcement regarding proven potash deposits at Kullstedt back in March, but this news was not picked up by the Aussie market – this could mean a significant price correction if and when PWN have the resources JORC evaluated. At this stage, PWN anticipates drilling approvals to be confirmed in October 2015 so drilling can start before the end of 2015 or early in 2016. 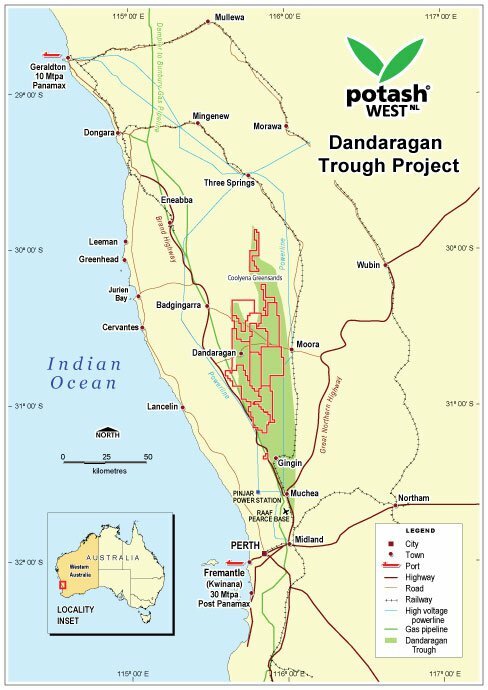 The second core project PWN is pursuing is the Dandaragan Trough in Western Australia. The Dandaragan Trough holds a globally significant deposit of greensand, containing both rock phosphate and glauconite (which contains potassium). The green outline shows the borders of a sedimentary basin called the Dandaragan Trough and the red outline shows PWN tenements. It’s clear that the majority of the Dandaragan Trough is under PWN control! PWN is leveraging the area’s solid infrastructure to reduce production costs and reduce market delivery times. Railway connects are solid to two ports, including connections to the three largest fertilizer plants in WA. There is a supply of gas, there are quality roads, and high voltage power capacity. Sparse vegetation and freehold land classification are also factors that make the Dandaragan region a very cheap and efficient place for PWN to extract glauconite and produce potash. 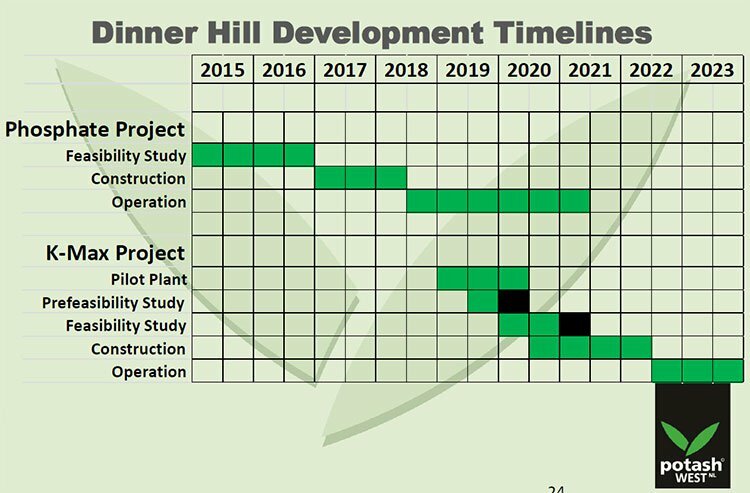 One of PWN’s biggest prospects is the exploration being done at Dinner Hill in the Dandaragan Trough. Dinner Hill is a prime location because the phosphate is closer to the surface and easier to obtain compared to other locations. Currently, Dinner Hill contains an indicated phosphate resource of 250 million tonnes with an exploration target of 1-1.5 billion tonnes. These numbers give PWN significant scope and upside within its current portfolio of exploration licenses in Western Australia. An advantage for PWN is its close ties to other companies in the Minerals and Fertiliser industry. By leveraging decades of technical expertise from within its own ranks and other individuals within the Fertiliser industry, PWN is on track to obtain a commercially viable project either via its own operations in Australia or as part of a pooled entity combining other companies in Germany. Probably the most important business relationship PWN currently has is close co-operation with Strategic Metallurgy, headed by PWN Non-Exec Director Gary Johnson. Mr Johnson’s expertise has been key to securing all-important technological patents that are pivotal to PWN’s long-term success. 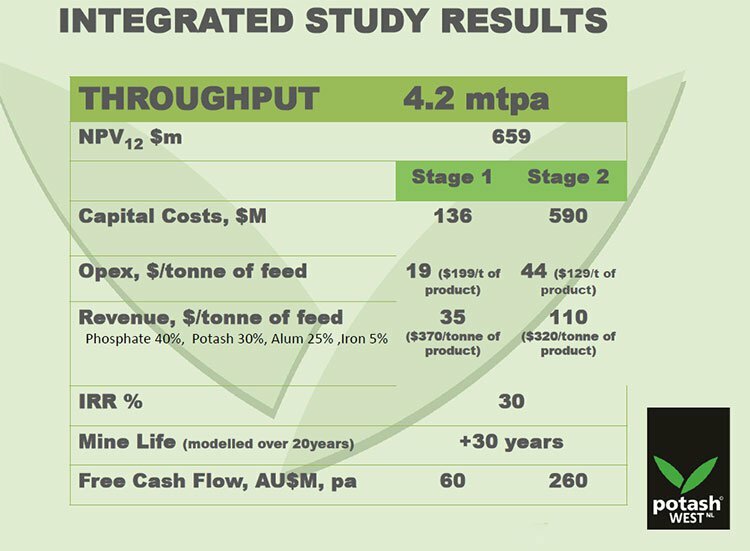 Strategic Metallurgy has developed a unique way of treating glauconite extracted from the Dandaragan trough to eventually produce Potassium Sulphate (Potash), called the K-Max process. PWN owns 100% of the intellectual property rights of this technology, and the PWN and Strategic Metallurgy are dove-tailing on similar tech development related to other minerals such as lithium. You’re no doubt aware that lithium has double digit demand growth predicted, based on lithium-ion batteries. PWN has 25% of a novel treatment of lithium micas, which could offer significant advantages in lithium production costs. This is the same technology Cobre Montana (ASX:CXB) are commercialising now – you can read about this technology is further detail here: ASX Company to Dominate Global Lithium Market? This stake in lithium technology provides a bit of extra upside in PWN leveraged to a metal tied to the growth of electric car batteries, amongst other futuristic uses. PWN’s long-term plan is to develop and build a fully operational potash production plant that utilises the cutting-edge K-Max technology developed by Strategic Metallurgy. Now, applying new processing technology can be risky and usually means longer feasibility studies and higher expenses. So instead of biting off more than it can chew on day one, PWN is taking a balanced approach. For the technically minded out there, PWN will be exploiting the phosphate horizon, to concentrate the phosphate nodules and produce single superphosphate. The traditional process is proven to be commercially viable and cash flow generated from these operations will go directly into development work on PWN’s K-Max process. 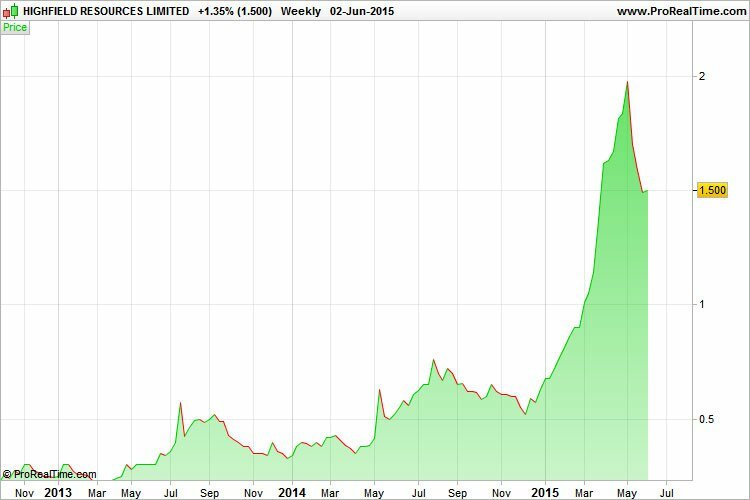 PWN will be producing a relatively Premium grade of Potash called SOP (sulphate of potash). Most of the Potash produced globally is actually MOP (potassium chloride) and priced at approximately $320 per tonne. This variety of potash typically accounts for 80% of total global production and makes up 75% of total sales. The bulk of the remainder is SOP potash, which PWN specialises in. SOP typically fetches a 40% premium on its MOP counterpart, however is currently being sold at almost double the price (approximately $600 per tonne). Very interestingly, SOP variety potash suffered almost no price volatility over the past few years amidst potash cartel wars on-going in Europe and North America that saw MOP potash prices plummet from above $400 per tonne down to $300. The reason for the volatility was Urakali’s announcement that it would leave the Belarusian Potash Company cartel and promising to spike production independently. However SOP potash prices remained stable throughout. PWN has been able to achieve a potassium extraction rate of more than 95% using a leaching technique fairly uncommon in other potash production. This bodes very well for the company’s short-term cash flow potential as well as its long-term value. As part of its interim plan to commence production as soon as possible, PWN wants to use its favourable location and proprietary processing technique to pick up other minerals and take them to market for additional revenue alongside ongoing core operations. PWN is planning to manufacture ‘single superphosphate’ (SSP) from the phosphate nodules at Dinner Hill. PWN estimates that it could produce 30% P 2 0 5 grade after grinding and processing. After mixing with sulphuric acid, the final product SSP would have a grade of 18% P 2 0 5 . The stage 1 phosphate production planned by PWN has low capital expenditure requirements and low technical risk. This would start the positive cash flow, allowing further development work for stage 2 to be self-funded. According to estimates, PWN could produce SSP at $200 per tonne and achieve a sale price of $370 per tonne which would generate around $60 million in annual free cash flow. The initial capital cost of launching phosphate production is $136 million and likely to yield 400,000 tonnes per year with over 75% going for export. It has consciously established projects in areas of low sovereign risk and high quality infrastructure, where there is strong regional and local demand for fertilisers. What PWN is trying to achieve is a microcosm of the broader food security issue globally. In the same vein that farmers must do more with less in order to remain competitive, so PWN is keen to produce better quality potash, and more of it. Stay tuned to The Next Mining Boom for updates on how PWN is progressing over the coming months – it’s a stock that’s definitely worth watching.